We're here! As some of you have noticed there hasn't been a newsletter since March. Explanations are due ... but first, a special thank you to those of you who wrote to ask about us. Thank you to you if you were one of them! It's always nice to be missed. And for those who wondered whether perhaps you'd 'fallen off the email list' - no, the list is quite secure, and it's not possible to fall off it. But things here have been busy and unsettled, so I'm keeping this newsletter fairly short and promise to be back for the rest of the year! So - explanations below, together with news of a new fun website for you to explore, a very important warning from one of our readers, and a beautiful Siamese cat art print for you to enjoy. Oh - and a couple of 'stop press' items for those of you who enjoy all things 'Siamesery'! The last few months have been a bit of a roller-coaster - truly a lot of ups and downs, as well as twists and turns! I think this year has been like that for many of us. Something, quite literally, in the air, with extreme weather events, political drama, and other unrest and upheaval affecting our lives. On a personal level ... towards the end of March my up-till-then reliable laptop went wrong. As I work from home and make my living with my laptop this was annoying, especially as my only fall-back is a very (very!) old PC. So everything came to a standstill while I sent off for a replacement. At about the same time I was asked by one of my clients to help with a big web project which took up much of April and May. ... you may remember that in our Christmas issue last year I mentioned that Bandit had been to the vet for dental work during which he was diagnosed with early stage chronic kidney disease. At that time we only had limited information, as a misunderstanding with the vet meant that only basic blood tests were done instead of the full blood panel I'd wanted. Even so, the results we had to work with indicated that Bandit had Stage 2 (of 4) kidney disease. The vet suggested a change of diet to kidney-friendly foods (which Bandit didn't like and often refused to eat, although we tried!) but no other treatment was recommended at that time. Bandit went back to the vet for a routine six-month check-up in April that revealed the need for more dental work - and possibly, more tooth extractions. He'd been doing really well, but in May he went through a period of not eating much and lost some weight, which the vet thought was probably because of problems with his teeth. Bandit does not like vets and will not allow bloods to be taken while he's conscious, so, because he needed sedation and anesthesia for the dental, this time I insisted that full blood work was done, as well as a urine analysis and a couple of other diagnostic tests. As it turned out, his teeth were fine and just needed cleaning, and luckily, no extractions, but the blood test results weren't encouraging and showed that the kidney disease had progressed to late stage 3. That meant more aggressive treatment, and getting used to providing medication several times a day as well as finding foods that Bandit would eat. Cats with kidney disease tend to suffer from nausea (there are things you can do to help this) and as a result they become very selective, turning their noses up at foods you were once sure they liked (and bought multiple packs of!) As weight loss is a big issue in cats with kidney disease, the one thing you must do is to make sure they keep eating. I want to write an article at some point about everything I've learned since this journey began (and it has been a huge learning curve) but for now I'll just say that for the moment, at least, Bandit is eating well and is fairly stable, although much thinner than he used to be. Of course, we don't know how long we'll have him. Some cats with kidney disease can go on for a good few years if their condition is well-managed, and obviously I'm hoping he's one of those. But you just never know ... and part of the journey this year has been coming to terms with the fact that we may lose him sooner rather than later. He has always, up till now, been a robust cat and I was hoping he'd be one of those Siamese cats who remain healthy into their twenties. He's thirteen or fourteen now so I don't suppose he'll make a grand old age, but we will, of course, do everything we can to keep him going as long as he wants to do so. Energetically, though, it's been a difficult time, and I'm sure you'll understand when I say that sending out a monthly newsletter hasn't been a top priority. It's always hard to cope with anything much when your animals are sick. Moving on to something completely different, I thought you might like to know about a website recently started by a friend of mine, Leyla. Leyla lives in France with, among other animals, six cats (one of them, Cumin, is Siamese) and all of them are miniature whirlwinds. Anyone who has indoor cats knows how much they enjoy working off their excess energy - generally, by leaping all over your furniture! In an effort to prevent her own furniture being torn apart, Leyla did a huge amount of research into cat trees, other cat furniture, and toys to keep her little band of ruffians occupied, and then, having done that, decided to put her research to good use by turning it into a website and sharing it with other cat-lovers. Leaping Cats (what a great name and how appropriate!) is the result. So if you've been wondering how to keep your own furry friends occupied and happy, do head on over there and take a look. One of our regular readers and visitors to our Facebook page, Donna Castele, wrote to tell me about an incident she'd had that could have had utterly tragic consequences if it hadn't been for Donna's quick thinking. To avoid this happening to anyone else, Donna wrote up the whole story and gave us permission to share it. I wanted to share an important reminder with everyone. Now, I'm pretty cat-savvy and aware of things that are dangerous to our cats, however just two weeks ago I unthinkingly brought a broken garden flower into my house. It had been broken just before blooming and rather than discard it, I placed it in a juice glass on my sink so that I could enjoy it after it opened. And then we had quite a scare. After the flower opened, my one-year-old blue point Ziva noticed it, pulled off a petal and began to chew. We saw this and took it away. She began to vomit hard, and I suddenly had the realization that I had unthinkingly brought a LILY blossom into my home. 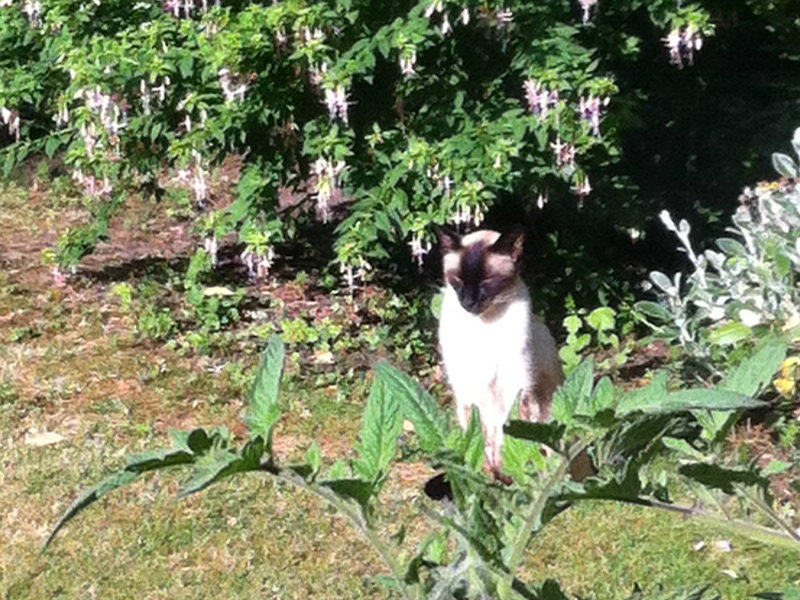 Lilies are THE MOST toxic of all flowers to cats! We immediately rushed her to the emergency vet where she was hydrated and kept under observation for 48 hours, and checked for kidney damage each day. Thankfully, she is just fine and, after testing, has no ill effects from this incident. A follow-up visit to our vet a few days after we brought her home confirmed all of this. But I was so sick and worried about my Ziva, blaming myself for my thoughtlessness, that I could not even talk about it until now and it has been two weeks. So while I still feel terribly about this incident, it is just too important not to share with all of you, and caution you against ever making a similar mistake. I certainly never will again. Thanks so much, Donna.This is a warning that bears repeating again and again and I wish more people knew how dangerous lilies can be, especially as they're often included in store-bought bouquets. The particularly lethal varieties are Easter lilies, Tiger lilies and others that have buds that open up with a stamen and pollen, but all members of the lily family, and all parts of the plant, are toxic to some extent if swallowed. 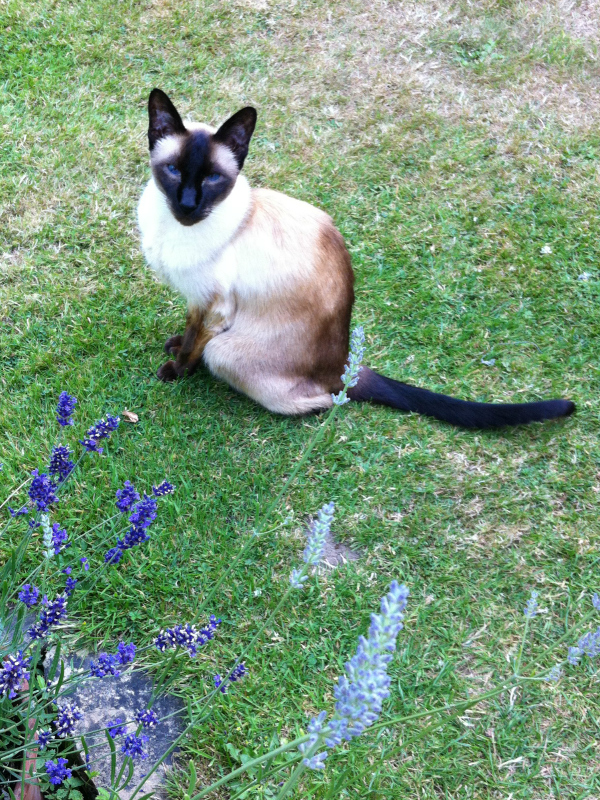 To celebrate her lucky escape (possibly using up one of her nine lives in the process) we're making Ziva our Meezer of the Month. 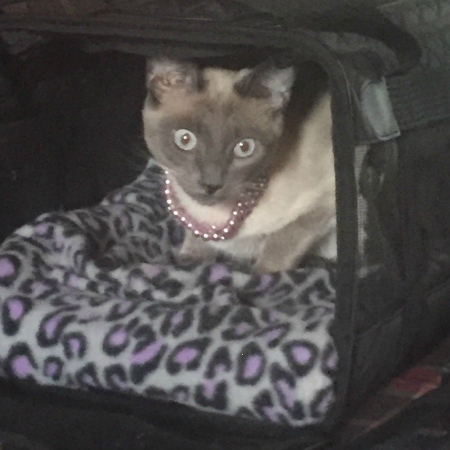 Here she is in her cat carrier, safely back from the vet. 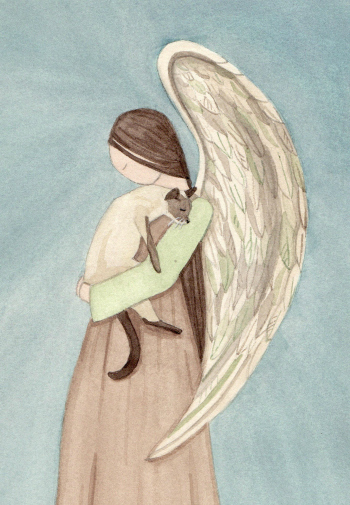 Whimsical, funny, and cute, Cindi Lynch's angels, cats, dogs and other animals are wonderful. I can't remember how or when I first came across Cindi's work but I've wanted a particular one of her prints for ages, and I finally got round to buying it not long ago. It feels especially appropriate right now because of Bandit's health, but also because this looks so very like him. His coat is perhaps a little darker than the cat in the print, but this is exactly the way he likes to be picked up and held. He's always been a shoulder cat, but has become especially clingy since becoming ill. Here it is, and I'm sure you'll love it too. This, and all of Cindi's other work can be found in her Etsy store, which you can find by clicking either the image or the link beneath it. Well, that's almost it from us for now but before we go I wanted to mention a couple of 'stop press' things. For those of you who love Suzanne Le Good's Siamese cat calendars, I've just heard that next year's is now available, with some wonderful new artwork for 2018. And if you enjoyed Madeleine Purslow's novel Moon Diamonds, Maddie has a new book just out called Hospitality to Angels. I haven't read this yet so I'll write more about it next month, but I do know that, while it's not specifically about Siamese cats, it does feature a chocolate point Siamese called Lawrence, who has an important part to play in the story. We'll be back in September but in the meantime our thoughts go out to anyone (and their animals) affected by Hurricane Harvey in Houston and the surrounding areas, or made homeless by recent forest fires in Oregon and western Canada, or the extreme flooding occurring at the moment in South Asia, or anything that else that's going on for you in your particular part of the world. Stay safe out there.